Over the course of the next three decades, the world’s food supply will have to expand to feed an additional two billion people. The world population is now 7.6 billion people and is projected to reach 9.8 billion by 2050, according to United Nations estimates. The question is: Can we meet that challenge without depleting the earth’s water supply? In a study published September 24 in Environmental Research Letters, a team of environmental scientists concludes that it is possible to sustainably increase irrigation systems globally so that crop production can feed an additional 2.8 billion people. 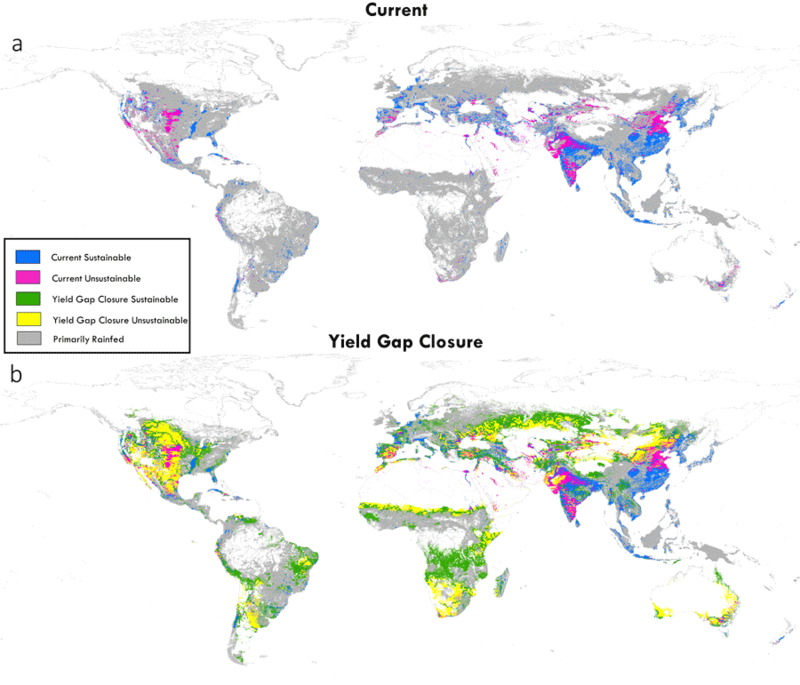 The study, “Closing the Yield Gap While Ensuring Water Sustainability,” found that global water consumption for irrigation could increase for certain croplands by 48 percent, expanding irrigation to 26 percent of rain-fed cultivated lands. And in a key finding, the authors maintain that such an increase in the irrigated food supply can be accomplished without harmful depletions of the world’s water supply. In addition to Davis, the team of scientists included lead author Lorenzo Rosa, a doctoral student in ESPM and other researchers from Politecnico di Milano (Italy) and UC Berkeley. The research team combined data from satellites and agricultural censuses to to analyze the world’s major agricultural areas. In all, the scientists analyzed a half a billion pieces of data related to climate and agriculture. The team was able to estimate the amount of water needed by each crop in order to grow. Much of the water a plant needs is provided through rainfall. But in many places farmers supplement this with irrigation from rivers, reservoirs, and groundwater so that their crops aren’t stressed during hot periods or dry spells. Using computer models to simulate the inner workings of a crop as it moves water from its roots through its stem and ultimately as water vapor from its leaves, the authors were able to quantify the difference between the amount of water crops actually need and what they receive and used that information to estimate feasible increases in crop production. Farmers typically under-water crops since they lack access to adequate irrigation infrastructure, says Davis. Most of the world's croplands are rainfed, so the challenge of accessing adequate water resources is widespread for farmers. Given that challenge, the team asked: Where will local water resources be sufficient to sustainably increase food production and feed future populations? By comparing maps of water demand with maps of local water supply, the authors were able to identify the regions in the world with enough water supplies to both expand irrigation and support ecosystems. The authors also pinpoint areas with adequate supplies of available freshwater that can sustainably increase irrigation for enhanced crop production without harming surrounding ecosystems. They found that sustainable expansion of irrigation into cultivated areas that are presently rainfed would allow for a 37 percent increase in food production. They also found that it would be possible to double calorie production for 50 countries, 29 of which are in Africa. Increasing irrigated food production decreases the need to expand agriculture into uncultivated lands, such as forests. 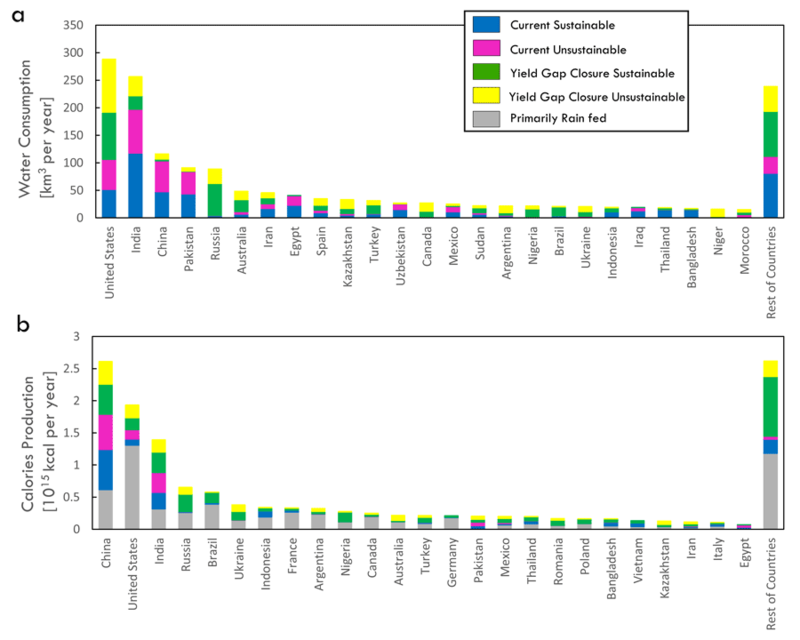 Collectively, China, the United States, India, Russia, Brazil, and Nigeria can contribute to about 46 percent of the global increase in food-calorie production associated with the sustainable increase in irrigation. China, the world’s top food calorie producer, has the greatest potential of any country to sustainably enhance crop production, enabling it to feed an additional 382 million people. India and Russia also have the potential to sustainably increase calorie production to feed 261 million and 222 million more people respectively. Africa, currently only sparsely irrigated, produces enough calories to feed 400 million people – making it the continent with the largest deficit between crop production and demand. In addition, the continent's population is expected to reach 2.5 billion by the year 2050. An increase in yields through investments that expand irrigation systems in Africa could thus sustainably feed an additional 450 million people and substantially reduce the continent’s dependence on food imports. Sustainable irrigation could also increase food self-sufficiency in countries that today meet large fractions of their domestic food demand through international trade. Mexico, Iran, Germany and Italy, for example, would experience a greater than 15 percent increase in calorie production. The study’s results show that adequate and informed investments in irrigation infrastructure can help feed billions more people, avoid agricultural expansion into natural habitats, and still leave enough water for environmental sustainability. Countries can use the information about how to increase crop yields and how much water will be required to produce it versus the amount of water available to create policies that increase crop production in areas that give the greatest “crop per drop,” (i.e., the areas that will give you the greatest efficiency, value or output for a given unit of water) and that leave enough water for nature, says Davis. Read the story at its source, Columbia University's Data Science Institute.